Sie haben eine Frage zum (92 m²), 3 Schlafzimmer und 1 eigene Badezimmer in Plaza Catalunya (Sweet Inn Apartment - Urgell)? 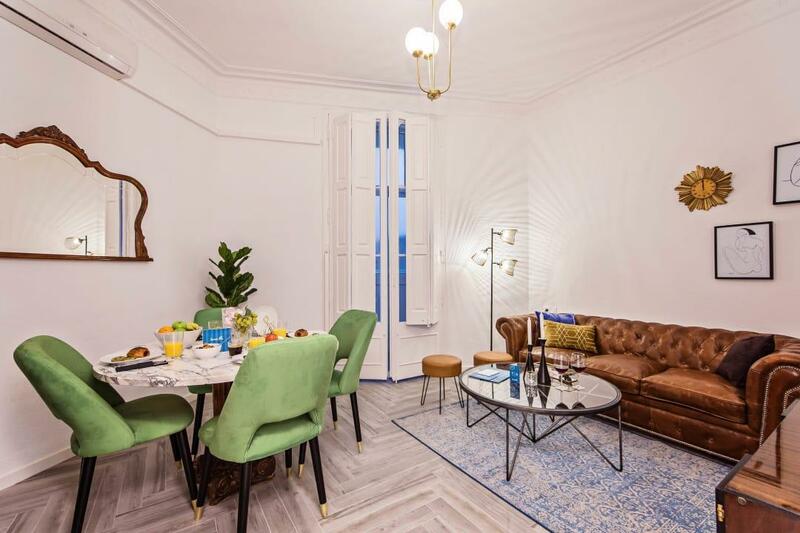 In the heart of Barcelona’s trendy Eixample district, the 3-bedroom Urgell apartment brings you into contact with Barcelona’s unique history. Visit the prominent Placa de Catalunya Square (17 minutes’ walk), or take your trip indoors to the Barcelona Museum of Contemporary Art (13 min). With the Urgell metro station located only 3 minutes from the apartment, you can explore attractions such as the beach or Barcelona’s old city, the Gothic Quarter (20 min), where medieval streets are lined with restaurants and trendy bars. This stylish vacation apartment has been decorated by our local designer for a taste of Spanish royalty. Three elegant bedrooms and a state-of-the-art kitchen will make you feel right at home. A sunny private balcony is one of the apartment’s highlights. Premium amenities include free WiFi, cable TV, high-end toiletries, hotel beds and linens, and a Nespresso machine. Perfect for families and large groups of friends, this gem is a one-of-a-kind experience in the center of Barcelona.